Saul ‘Canelo’ Alvarez is scheduled to fight Daniel Jacobs on May 4th. 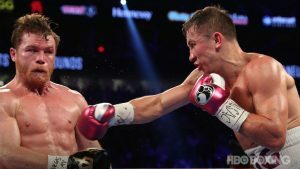 However before this fight was sealed and made official, it was expected Canleo would fight Gennady Golovkin for the third time. Golden Boy Promotions boss, Oscar De La Hoya, still expects a trilogy fight between the two to come to fruition. De La Hoya was asked about a trilogy fight with GGG and he responded, “There’s no doubt whatsoever,” he replied in an interview with Fox Sports Asia. However, Canelo fist has the not so small task of fighting Daniel Jacobs, the first fighter to take GGG the distance when he lost by unanimous decision in 2017. Golovkin is a free agent at the moment and the likelihood of a third fight materializing would ony likely happen if GGG signs with DAZN. According to De La Hoya the negotiations for the Jacobs fight were straight forward after he used social media to coax Jacobs team into negotiations. “I sent out a tweet that said we were going to talk to GGG and make the third fight happen and Jacobs’ promoter, Matchroom Boxing, called [Golden Boy president] Eric Gomes the next day and said you have a fight with Jacobs.